The 2018 Crystal + Lucy Award honorees included the following: Brie Larson with The Crystal Award for Excellence in Film presented to her by actress and friend Jessie Ennis; Channing Dungey with The Lucy Award for Excellence in Television presented to her by actress Ellen Pompeo; Alexandra Shipp with the Women In Film Max Mara Face of the Future Award presented to her by actress Regina Hall and Max Mara Vice President US Retail and Global Brand Ambassador Maria Giulia Maramotti; songwriting and production team NOVA Wav (Denisia “Blu June” Andrews And Brittany “Chi” Coney) with the Women In Film Artistic Excellence Award presented to them by duo Chloe x Halle; and the Women of Black Panther in front of and behind the camera were honored with The Lexus Beacon Award, which was accepted by Marvel Studios EVP of Physical Production Victoria Alonso on behalf of the group, and presented to her by Black Panther actor Isaach de Bankolé. 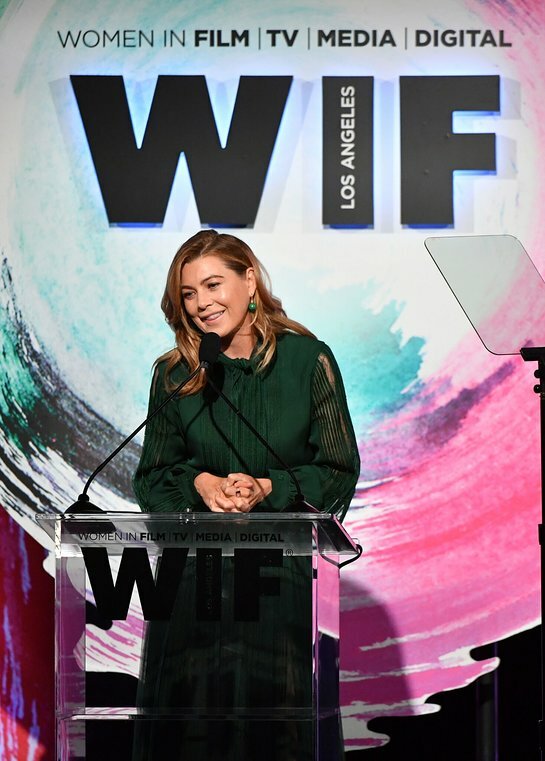 The evening also celebrated Women In Film, Los Angeles’ 45th Anniversary and recognized the leaders of the gender parity movement in Hollywood with the powerful “45 Years of Advocacy Celebration” segment presented by Oscar-winning actress Frances McDormand. Dr. Stacy L. Smith (Founder and Director, Annenberg Inclusion Initiative) accepted the honor on behalf of the 22 leaders from the past and present that attended. The group included Allison Anders (Filmmaker), Barbara Boyle (Film Producer), Madeline Di Nonno (The Geena Davis Institute on Gender in Media CEO), Jane Fleming (WIF Board President Emeritus), Melissa Goodman (Director of the LGBTQ, Gender and Reproductive Justice Project at the ACLU of Southern California), Iris Grossman (WIF Board President Emeritus), Catherine Hardwicke (Filmmaker), Christy Haubegger (CAA Agent), Rosilyn Heller (Film Producer), Gale Anne Hurd (Film Producer), Lynne Littman (Filmmaker), Katie McGrath (Bad Robot Co-Chief Executive Officer), Rachel Morrison (Cinematographer), Marcia Nasatir (Film Producer), Susan Bay Nimoy (Filmmaker), Euzhan Palcy (Filmmaker), Kimberly Peirce (Filmmaker), Keri Putnam (Sundance Institute Executive Director), Angela Robinson (Filmmaker), Cathy Schulman (WIF Board President) and Jamie Tarses (TV Producer/Executive). Additional attendees included Rosanna Arquette (Actress), Shohreh Aghdashloo (Actress), Amy Baer (WIF, LA Incoming Board President), Lake Bell (Actress / WIF, LA Board Member), Alison Brie (Actress, GLOW), Shari Belafonte (Actress), Alice Eve (Actress, Replicas), Kate Flannery (Actress), Katherine Langford (Actress, 13 Reasons Why, Love, Simon), Jane Lynch (Actress), Kathryn Prescott (Actress, Dude), Mishel Prada (Actress, Vida), Francia Raisa (Actress, Grown-ish), Kirsten Schaffer (WIF, LA Executive Director), Diane Warren (Songwriter), Michaela Watkins (Actress, Casual), and more. Oscar Award-winning actress Frances McDormand took the stage to present the “45 Years of Advocacy Celebration” segment. During her remarks, McDormand restated a call-to-action for the Inclusion Rider showing off bumper stickers in support of the initiative. The Inclusion Rider, developed by Dr. Stacy L. Smith (Founder and Director, Annenberg Inclusion Initiative), is an addendum to an actor/content creator’s contract that stipulates that inclusion — both on camera and behind the scenes for crew members — be reflected in films. Black Panther actor Isaach de Bankolé presented the Lexus Beacon Award to Victoria Alonso, Marvel Studios EVP of Physical Production, who accepted the award on behalf of the Women of Black Panther in front of and behind the camera. Alonso was joined by some of the women in leadership behind the camera including Rachel Morrison (Director of Photography), Debbie Berman (Editor), Ruth E. Carter (Costume Designer), Sarah Finn (Casting Director) and Helen Pollak (Unit Production Manager). Grey’s Anatomy star Ellen Pompeo presented The Lucy Award to ABC Entertainment President Channing Dungey. 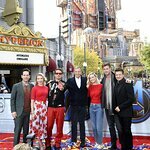 Brie Larson dedicated her acceptance speech to draw attention to the USC Annenberg Inclusive Initiative’s recent findings that “67% of the top critics reviewing the 100 highest-grossing movies in 2017 were white males. Less than a quarter were white women and less than 10% were underrepresented men, Only 2.5% of those top critics were women of color.” Larson called for more diversity among reporters and photographers at press events and announced that the Sundance Film Festival and the Toronto International Film Festival have committed to allocating 20 percent of press credentials to underrepresented critics. Kirsten Schaffer (WIF, LA Executive Director) opened the ceremony and discussed WIF’s programs including the launch of the Sexual Harassment Help Line last fall. Since early October, the world’s attention has been focused on the unfolding story of countless allegations of sexual harassment perpetrated by many powerful men in the entertainment industry. In response, Women In Film launched a Sexual Harassment Help Line — an integrated program to refer survivors of harassment to attorneys, designated mental health counselors, and law enforcement professionals. Anyone, regardless of gender, can access the Sexual Harassment Help Line at 323.545.0333. During Cathy Schulman’s (WIF, LA Board President) remarks, she talked about ReFrame, a collaboration (partnership) between WIF, Sundance Institute and more than 50 Hollywood leaders to create a formal action plan to further gender equity in the media industry. Recently, ReFrame announced the first class of ReFrame Stamp feature film recipients based on an extensive analysis of IMDbPro data on the top 100 domestic-grossing films of 2017. The recipients include Warner Bros.’ Everything, Everything, and Wonder Woman, Universal’s Girls Trip, A24’s Lady Bird, and Twentieth Century Fox’s The Post. A film with the ReFrame Stamp serves as a mark of distinction for projects that have demonstrated success in gender-balanced film and TV productions based on criteria developed by ReFrame in consultation with ReFrame Ambassadors, producers and other industry experts. For more information visit, ReFrameProject.org. Sister duo Chloe x Halle presented the WIF Artistic Excellence Award to music producers NOVA Wav (Denisia “Blu June” Andrews And Brittany “Chi” Coney) and performed “Warrior” from the soundtrack for A Wrinkle in Time. Alexandra Shipp (WIF Max Mara Face of the Future Award Honoree), Alison Brie (Actress), Alice Eve (Actress), Amy Baer (WIF, LA Incoming Board President), Cathy Schulman (WIF Board President), Channing Dungey (The Crystal Award Honoree), Jane Fleming (WIF Board President Emeritus), Katherine Langford (Actress), Kirsten Schaffer (WIF, LA Executive Director), Lake Bell (Actress / WIF, LA Board Member), Maria Giulia Maramotti (Vice President US Retail and Global Brand Ambassador), Michaela Watkins (Actress), NOVA Wav (WIF Artistic Excellence Award Honorees), Regina Hall (Actress), and Rosanna Arquette (Actress) arrived dressed in Max Mara. Each of the honorees and presenters took home a gift bag with an assortment of Lancôme skincare products and cosmetics. Lexus showcased the 2018 LS 500 sedan inside the ballroom and a floral photo booth for guests to enjoy. The 2018 Crystal + Lucy Awards was designed and produced by Academy Award-winning producer Cathy Schulman and Tony Schubert of Event Eleven.